I figure that if Kroger can put a new product on special, I can continue to barrel through reviews. So, that brings me to another Muller yogurt review with this first time review of one of their Greek yogurt products, but not a first time review of their Corner products. 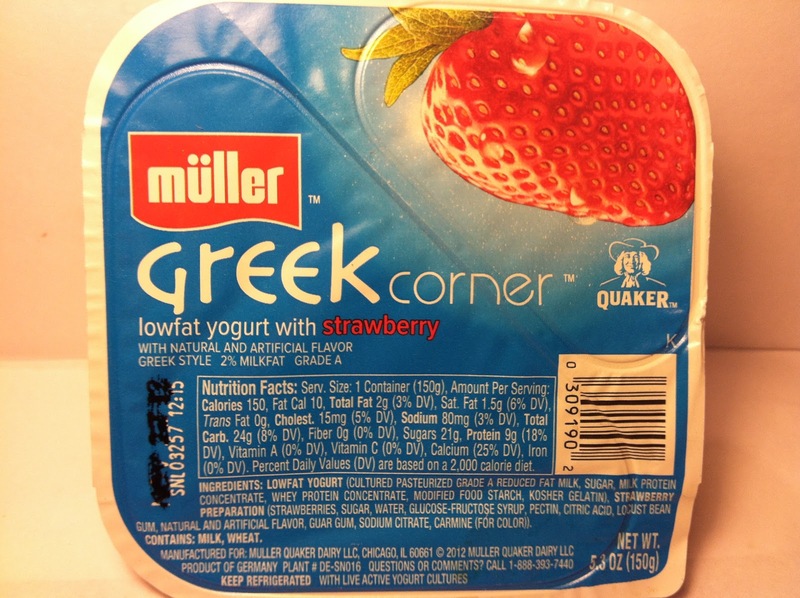 I picked up this single serving container of Muller Greek Corner Lowfat Yogurt with Strawberry at the aforementioned Kroger on sale for $1.00 and it comes in at 5.3 ounces with 150 calories and nine grams of protein. 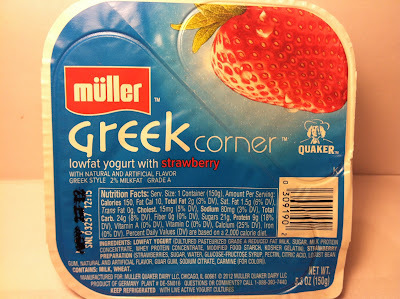 Muller is a Quaker product, so the fact that Muller has multiple variations of its Corner line with multiple kinds of yogurt should not be surprising. Since this is from the Corner line, the cup is designed with the side car type design in that you are strongly encourage to dump the fruit topping into the yogurt and stir them up. Since this was my first review of their Greek yogurt version of the Corner line, I took a closer look at the actual plain yogurt itself and what I found was a yogurt that was stiffer than their regular yogurt, as one might expect, but not nearly as stiff as a typical Greek yogurt like you might find from Chobani, Fage, etc. One of the reasons that this yogurt was not as stiff was that it was seeping water and I don't know about you, but when I see yogurt that is seeping water, it doesn't exactly excite me. One thing that the plain yogurt did have going for it though was that it did have the tangy smell of Greek yogurt, but it was not particularly strong. The strawberry mix itself did have a fairly strong smell of strawberry and being that strawberry is the flavor component of this cup, the fact that it was strong was certainly encouraging. What was also encouraging was the abundance of large strawberry chunks that were compacted into such a small space. Because of these chunks, the strawberry mix itself was quite thick like a jam and there definitely was no seeping here like there was in the yogurt. One thing I did find funny was how bright red this mix was, but after perusing the ingredient list, I saw that artificial coloring was used in this, so the vibrancy of the red should not have surprised me in the slightest bit. Since they package these separately, it would not be due diligence on my part if I did not at least taste these separately prior to mixing them together. After tasting both, I was struck by how strong the flavors of both components were. 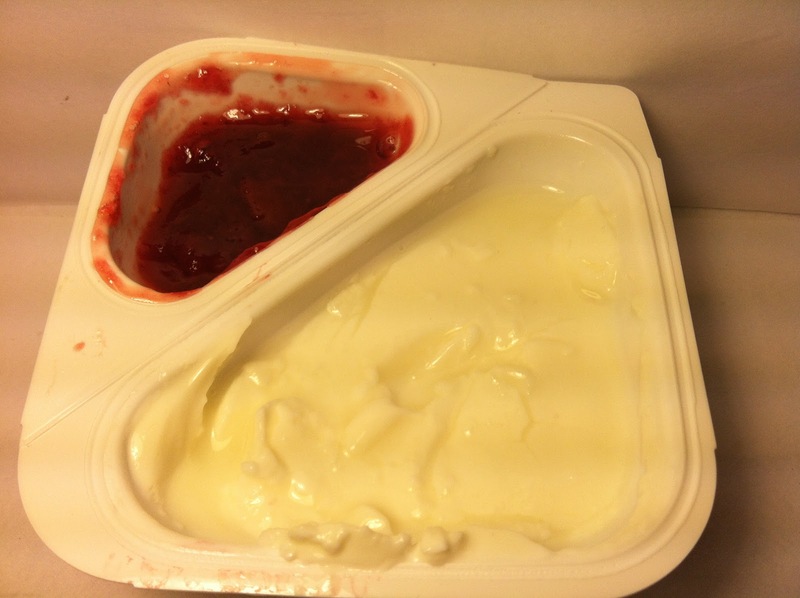 The Greek yogurt itself, while not particularly thick, did have a nice, but manageable tang to it and that strawberry mixture had a pleasing sweetness and tang to it as well. That sweetness and tang could almost dupe a person into thinking these were fresh strawberries, but as we all know, that is definitely not he case when you are dealing with a mass produced product. Encouraged by the individual taste of each of these, I was kind of excited to mix these two together and after I did, my excitement faded. Don't get me wrong, the flavors were still there, but mixing the two strong flavors together ended up muting both of them in a way that the combined mixture itself was more of a mild and tame flavor. I expected extreme tang, but I just didn't get that. That's okay and the combination itself had nice flavor, but it was kind of a let down after what I was expecting. Buy It or Fly By It? Despite the fact that this ended up disappointing me, that was because of my expectations as opposed to the flavor of the product itself. This ultimately was a good product and despite my personal letdown, this is not a letdown in general and I give this one a BUY IT rating. It's a nice introduction into Greek yogurt from the Corner product line for me and I'm interested to see what other kinds of things are coming up in future Muller Greek Corner reviews.